Big, bold Jones flavor. A fraction of the fat. Our new sandwich-sized chicken sausage patties will be your favorite way to start your day. Just like our original breakfast sausages, these chicken sausage patties are made with our custom spice blend that we make ourselves. And because we never add binders or fillers, you can feel confident eating our Certified Gluten-Free chicken sausage. With 6g of protein and ​60% less fat, does it get any better? Whether you serve them with eggs and pancakes or pile them into a waffle breakfast sandwich, these all-natural breakfast sausage patties are the perfect fit. 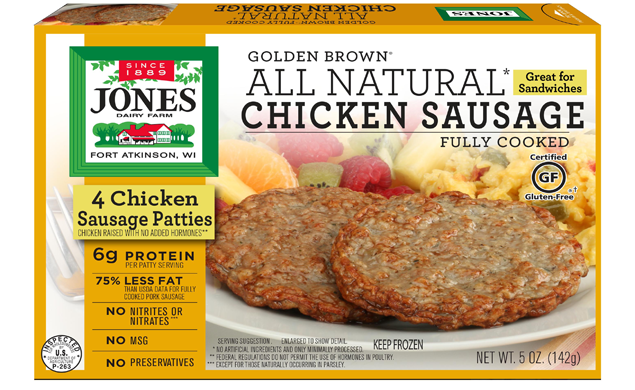 Like all of the breakfast sausages in our Golden Brown® line, our chicken sausage patties are fully cooked and easy to prepare. Look for them in the freezer section. Heat chicken sausage patties on MEDIUM (50% power), using microwave-safe plate lined with paper towel, for times shown, or until heated through. When cooking frozen chicken patties, turn over halfway through cooking for even heating.